You are currently browsing the NSI Blog blog archives for August, 2016. First there was the turtle, now there’s the chicken. Last year, NAILS posted about a resourceful nail tech who teamed up with a veterinarian to save the life of a turtle whose shell had been crushed when it was hit by a car. The tech used NSI acrylic to patch the turtle’s broken shell. 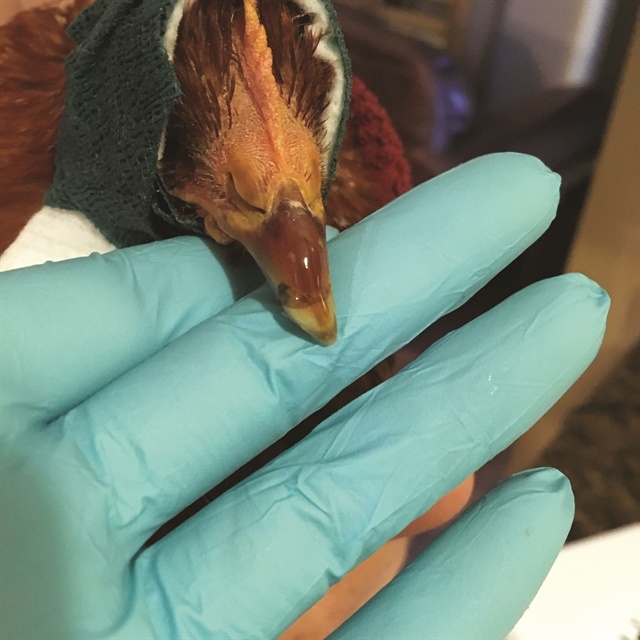 Not to be outdone, nail tech, instructor, and NSI educator Jana Warnke recently used NSI’s Balance Gel to repair a broken beak on one of her backyard chickens. Warnke took care not to allow a thermal reaction to occur when curing the product. Warnke opted to use NSI’s Balance Gel instead of a wrap. 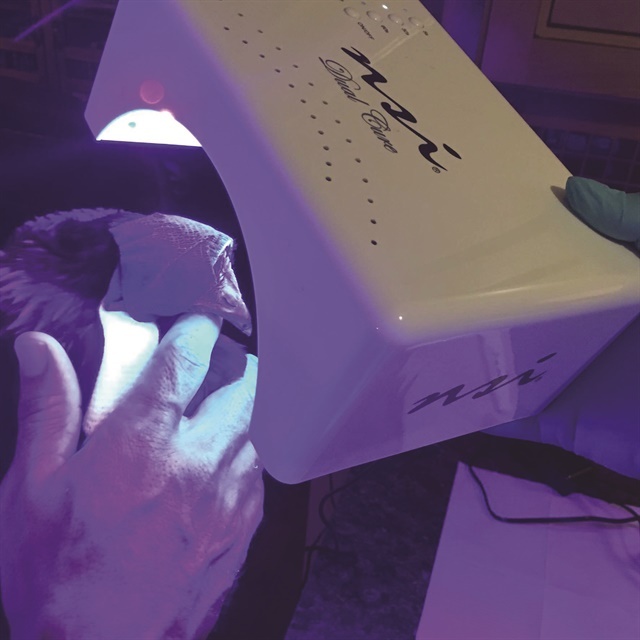 “After cleaning the area really well, we wrapped her face and covered her eyes to protect her from the LED lamp, then I set to work prepping the surface as normal with a hand file, just to remove the shine. I applied a thin layer of Bonder and applied layers of gel in small quantities,” she explains. “I then set the lamp near her beak and allowed the gel to harden, making sure there was no potential for heat. It cured completely after about four flash-cures.” Rue.b remained asleep during the entire procedure. “The new beak wasn’t straight, but it was sturdy and she immediately began to eat since the pressure was no longer painful.” The beak has since grown out completely. The patient snoozed through the procedure. You can read about the injured turtle at www.nailsmag.com/turtle. NSI needs Nail Tech Bloggers! We want to send professional Nail Tech bloggers FREE NSI product to use for review in detailed, fun blog posts! Are you a blogger? Do you love NSI product, or want to try it? Do you have a following? Let us know by filling out our form! Click on the image to get in touch! Virgos are incredibly orderly and have immense self control, but they tend to hide their more sensual and imaginative side. Like Gemini, they are ruled by planet Mercury, and have the tendency to worry more than other signs. The calm and tranquil greens put their hearts at ease. View our Virgo inspired gallery!